Thank you to everyone who joined us for our annual CSA Member Social last Sunday! It was sunny and crisp, the food and company were delightful, and the crafting tables were busy and beautiful. We really love meeting new CSA members, chatting with those of you who have been eating this food for years, and even introducing some veteran CSA members to the farm for their first visit! We’re covering all of these greens (pictured above) in order to pull a few more salads out of 2018. 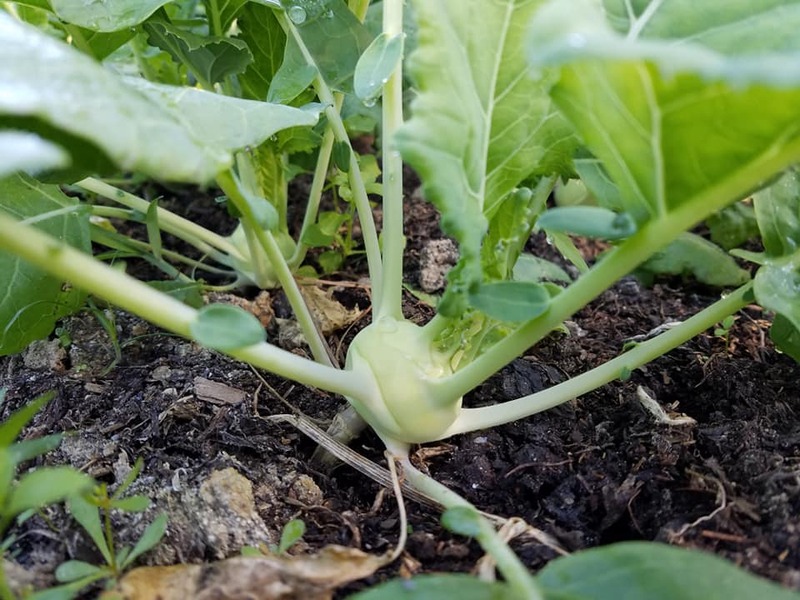 We may need to really root for the wee kohlrabi that are still trying to grow (no pun intended…we don’t harvest the roots of these). Grow kohlrabi, grow! As we’ve mentioned in previous emails, we have planted more greens than usual this fall. Some of those are for our CSA members and farmers’ market customers in November. Others are for our newly formed Winter CSA Shares! For December through April, we will keep selling our harvests through our self-serve FarmStand, the Farmers’ Market at St. Stephens, and Fall Line Farms/Local Roots, but now we also have Farm Shares available December through April, with pick up every other week. (Fine print: pick up is only available at certain pick up locations, and there’s no share January 5th.) Sign up will be open soon! We’ll continue to announce that we have big changes coming down the pike for our CSA. 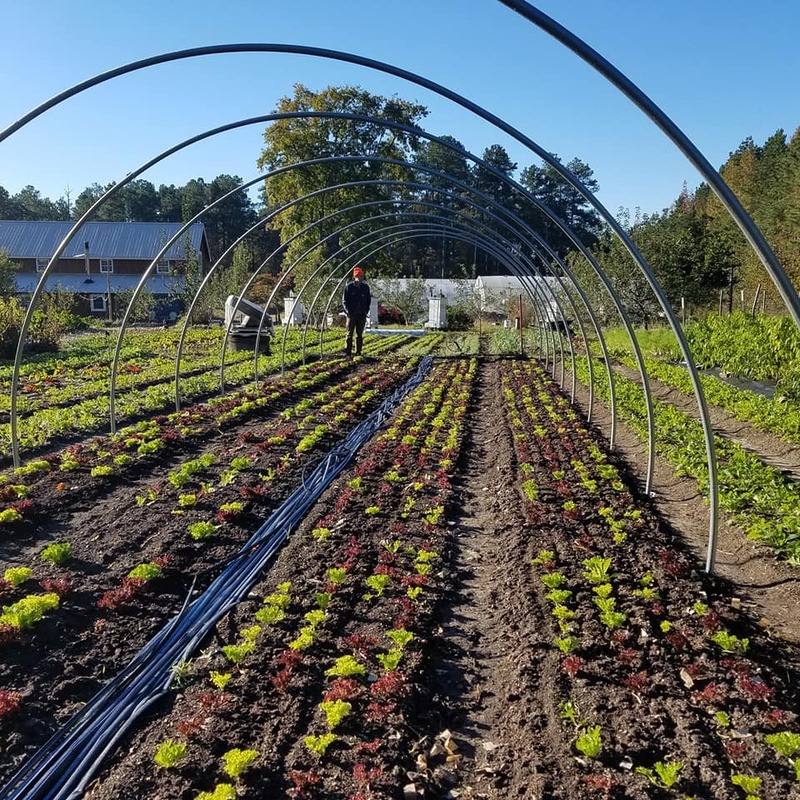 Starting with the Winter Share, and then continuing with the regular season share (April through November 2019), we will be using a new CSA software that allows you to customize your Farm Share! We are so excited about this because we want Arugula lovers to get Arugula when we have it, and we want Summer Squash lovers to get as much of it as they desire. We also want those who have no love for fresh herbs to be able to avoid them, and for households that don’t eat nightshades to still be able to enjoy our FarmShare (but be ready to eat more greens if that’s the case!). This new CSA software is called “Harvie” which helps CSA farmers meet their members’ needs through a customizable Farm Share program. Each week’s share will be based on your preferences. For example: don’t like beets? You will never get them in your share! 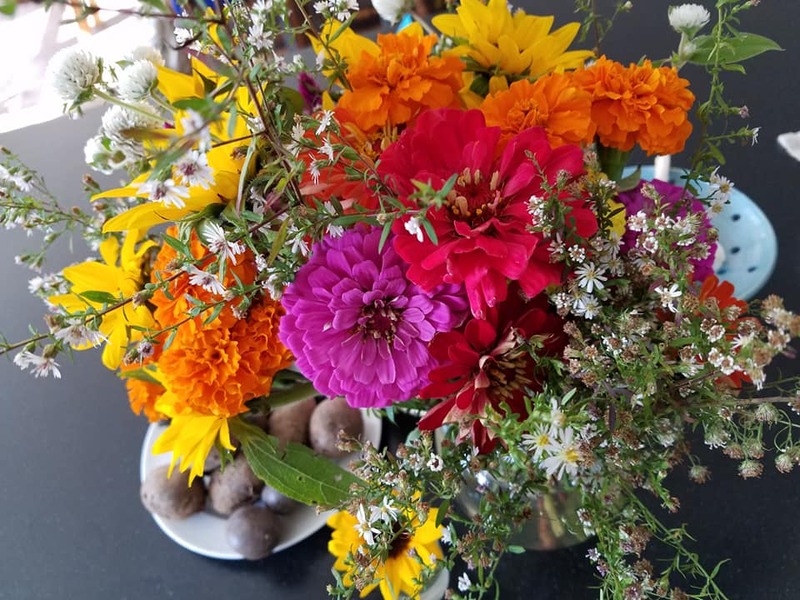 Want flowers in your share whenever you can get them? Just indicate that during sign up. And – each week you can further customize your share, as well as order extras if you’d like. Get ready to see the “Harvie” name more in future emails letting you know that sign-up is open and how the new sign-up works. (Great bonus difference: You only have to sign-up once, unlike our old software! You’ll be able to auto-renew, and the system keeps track of your preferences you indicated during initial sign up. Sign up will be open in about another week. Current members: If you sign up for the 2019 season by November 15th, you’ll get an EXTRA share of veggies the first week of December at no charge! Thank you for your anticipation! Salad, Kale, Radish, Turnip, Peppers (Non Spicy Jalapenos and/or a couple large sweet peppers), Fennel, and Mint. Turnips – Slice these cuties raw on top of a green salad, or add to soup (see the Kale soup recipe below – it’s great with Turnips), or make Roasted Turnips. Fennel – This tasty plant is also packed with medicinal qualities. Enjoy it with (someone else’s) carrots in Roasted Carrots & Fennel or make Arugula & Fennel Salad with Lemon Vinaigrette or simply slice it thinly and add it to a green salad of our Kale. Use the fronds by adding them to salads or making Fennel Pesto. See other Fennel Fronds Ideas Here. Kale – Colder weather is settling in! We really love Kale and White Bean Soup. We also sneak Kale into unsuspecting places, like in tomato sauce to be served on pasta. See this recipe for Pasta with Tomato Sauce and Kale or freestyle with your favorite tomato sauce. Radishes – Delicious raw on top of green salads, or sliced and served on top of buttered toast with sea salt, or make Radish Cream Cheese Dip (we add some Sunny Paris herb blend from Penzey’s, and don’t usually add that much garlic). Arugula, Fennel, Garlic, Hearty Greens Mix, Jalapeno Peppers that are NOT spicy, Kale, Microgreens, Sweet Peppers (bullhorn shape…the last ones! ), Radishes, a few Red Tomatoes,…and our Organic Hearth Baked Bread (Baguettes, Herb, Whole Rye, Raisin, & Seed loaves for this weekend). 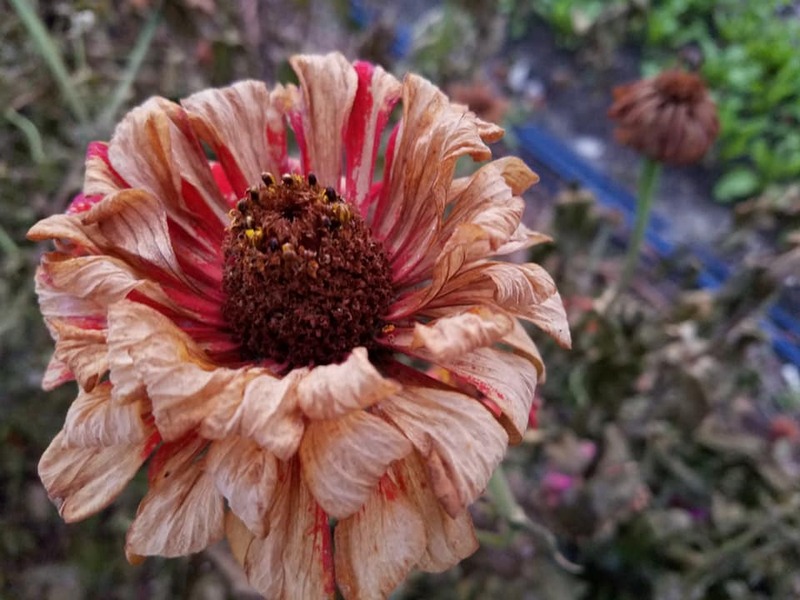 Anything remaining after CSA shares are distributed and our farm stand is shopped (plus the bread we bake Saturday morning)… we’ll bring on Saturday to the Brandermill Green Market and the Farmer’s Market @ St. Stephen’s . Keep an eye on what we have available via the online farmers’ markets: FallLineFarms.com and Local Roots Food Coop.